2248a, Used Rims, 18X7-1/2, 5 LUG, 4-1/2", 05-07, DODGE, CHARGER, MAGNUM, POLISHED FINISH, 10 OR 5 DOUBLE SPOKES, WITHOUT BLACK ACCENT, ALLOY. 2248c, Used Rims, 18X7-1/2, 5 LUG, 4-1/2", 05-07, DODGE, CHARGER, MAGNUM, POLISHED FINISH, 10 OR 5 DOUBLE SPOKES, WITH BLACK ACCENT, ALLOY. 2248a, Used Rims, 18X7-1/2, 5 LUG, 4-1/2", 05-07, DODGE, CHARGER, MAGNUM, POLISHED FINISH, 10 OR 5 DOUBLE SPOKES, WITH BLACK ACCENT, ALLOY. 3366b, Used Rims, 15X6, 4 LUG, 4-1/4", 00-03, FORD, FOCUS, 5 DOUBLE SPOKE, JACK SILVER, ALLOY. 3431, USED RIM, 15X7, 5 LUG, 4-1/2", 00-11, FORD, RANGER, MAZDA, B2300, ALUM, MACHINED, 5 DOUBLE SPOKE. 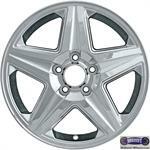 4064, Used Rims, 17X6-1/2, 5 LUG, 115 MM, 05-06, BUICK, RENDEZVOUS, OPT PZE, 5 DOUBLE SPOKE, CHROME, ALLOY. 5071, Used Rims, 17X6-1/2, 5 LUG, 115mm, 06-10, CHEVY, IMPALA, MONTE CARLO, OPT PFH, MACHINED FINISH, 5 DOUBLE SPOKE, ALLOY. 5361, Used Rims, 18X7, 5 LUG, 110 MM, 08-11, CHEVY, MALIBU, OPT NW2, 5 DOUBLE SPOKES, MACHINED FINISH, ALLOY. 550, HUBCAP USED, 16", 01-02, DODGE, STRATUS, CPE, SPARKLE SILVER, 5 DOUBLE SPOKE, 5 FAKE CHROME LUG NUTS, ETCHED RAMS HEAD, PLASTIC CLIPS, WIRE RING. 5502, USED RIM, 18X8, 8 LUG, 180MM, 11-13, CHEV, SILVERADO, 2500,3500, POLISHED, 5 DOUBLE SPOKE. 5525a, USED RIM, 16X6, 5 LUG, 105MM, 12-16, CHEV, SONIC, ALUM, PAINTED SLIVER, 5 DOUBLE SPOKE.